The family that became parents recently have a lot of things to think about. Feeding, supporting of deep sleep, cleaning diapers — all of that makes explode the heads of first-time parents. This cycle can leave no place for the rest. In that case, if the parents do not have useful stuff that makes their lives easier. Naturally, a lot of brands have produced gadget to simplify the lives of new parents. Whether it is a rocker that helps baby relaxing via automatically movement, or humidifier that also plays gentle sounds, even just one of these home appliance could make a huge help. So, if you are in the hunt for a gift for new parents, the useful things can be the right decision. The properly selected gadget is able to add a few hours of relaxing to a new parent’s schedule. Here we have already found some gift ideas for new parents that they will not want to regift. A humidifier is an essential gadget for new parents. Unlike the adults, the baby’s skin is more delicate. It will become irritated more easily in the drier room. A humidifier offers humidity into the air to prevent such issue. Vicks Warm Mist Humidifier is the right choice for your friend or family members who became parents recently. The benefit of using the evaporative humidifier like that is the refuse of most bacteria and germs via high temperature. It also makes a room warmer, let to turn down the thermostat. 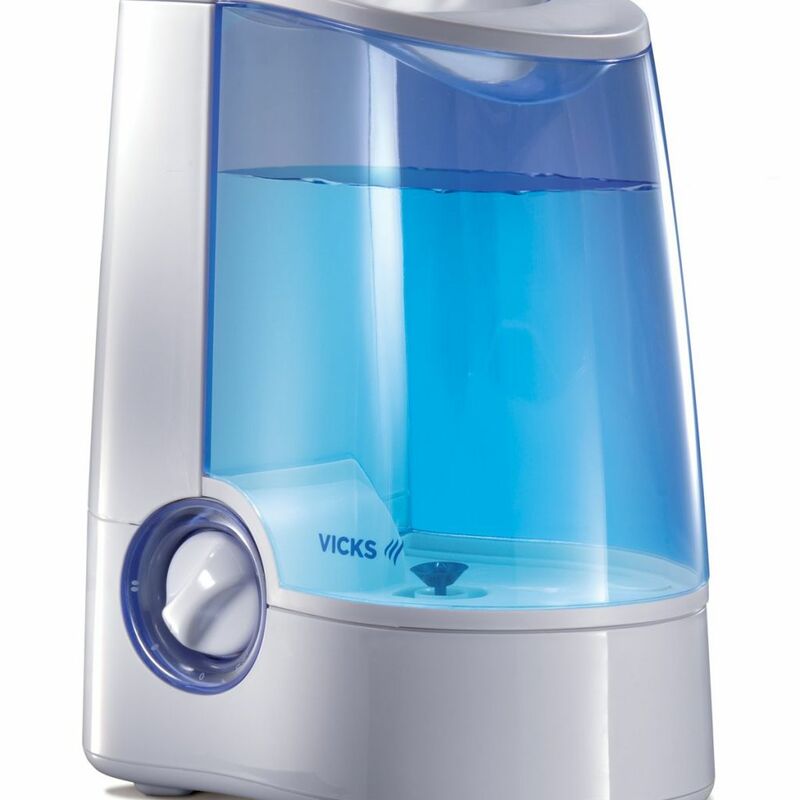 The design of Warm Mist Humidifier by Vicks includes one gallon of water, which means it can work about 24 hours. It also can be used for aromatherapy via a cup for essential oils. Before purchase, ensure your presentee has a spot in the nursery to put humidifier out of kid’s reach. A baby monitor helps young parents to keep tabs on the baby every moment. Even when they are occupied in another room, the monitor shows when the little one needs care. 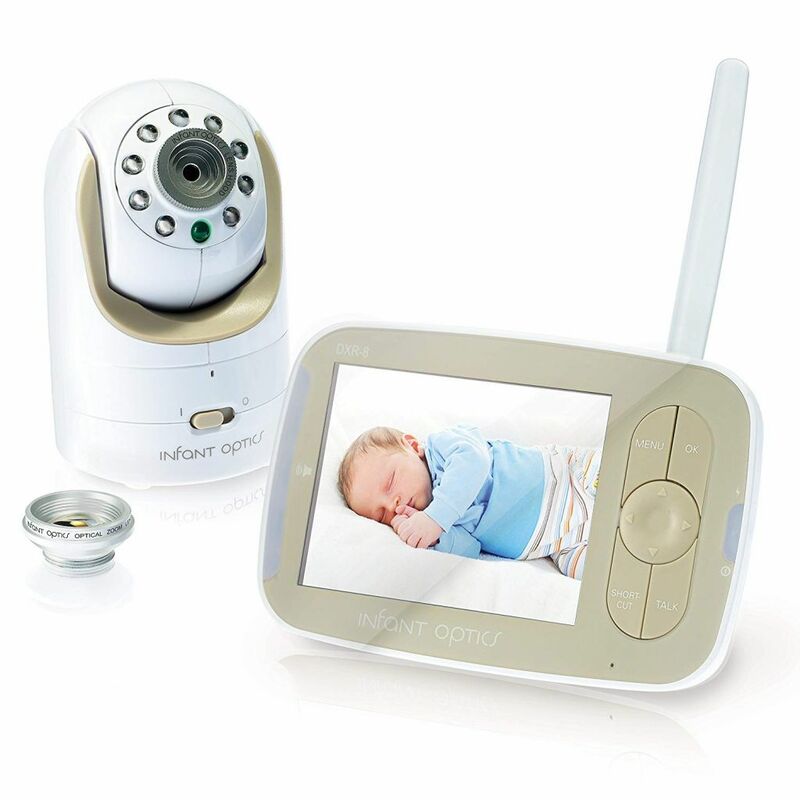 The Infant Optics Video Monitor with video and audio features offers the whole baby support. It is particularly useful to track the movement, position and understands the baby’s wants. This gadget is especially useful for a baby who sleeps separately from parents. Also, it is a great choice for naps. The Video Monitor by Infant Optics is delivered with interchangeable lenses. So, your presentee can customize camera image via changing different lenses such as normal, zoom and panoramic. Among other features of this device, it is important to note the real-time video translation (on 3.5 LCD screen) and about 10 hours working without a battery charge. Even young parents don’t know better moments than cuddling with baby, sometimes they need free hands and have a rest. In that case, grandparents or relatives are able to help. But if they can’t, the automatic gadgets become a deal. Such as Auto Rock by Fisher-Price. This automatical rocker gives an essential snoozing and relaxing time for new parents. The Fisher-Price Auto Rock offers a safe area for teary-eyed baby. It’s two motion speeds provide calming and support good naptime. This gadget is also suitable for baby’s playtime. For enjoyable entertainment, there are 12 songs and 3 sound effects. Also, the rocker comes with linkable clacker toy. New parents take care of baby’s entertainment time-to-day. But always they do not have a lot of time for themselves. In this case, the gadgets that allow multitasking, are going in. For example, the devices which help to breathe the air in the park with the baby, and listen to the inspiring TED talks. 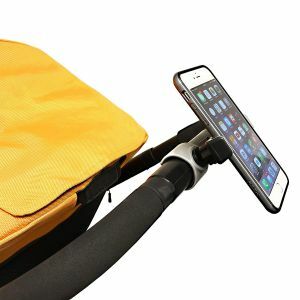 The Emmzoe Smartphone Mount for Stroller keeps hands free when the young mother or father is on the move with a baby. It is a solution for the calm time both for parents and their little one. Thanks to the adjustable design the holder by Emmzoe is suitable for most smartphones sizes (up to 3.35 inches wide) and screens diagonals. The feature of 360 degrees rotation helps to position the phone towards baby and take a quick photo. Trekking around the room with a little baby might be a big tack for a new mother. Especially when the baby is screaming to change the diaper. And more difficult, when this situation happens far from the baby’s room and changing table. 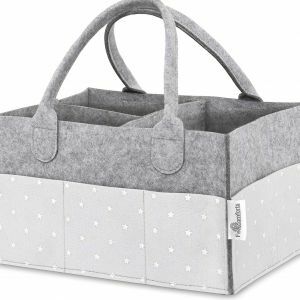 The diaper organizer such as Baby Diaper Caddy by Feel Comforts can reduce young parent’s discomfort. This organizer is made of durable felt material. Thanks to that it is easy to carry and displacement. It is also excellent both for home usage and outdoor walks. This diaper caddy by Feel Comforts is spacious and portable. Due to the size of 9 x 7 x 13 inches, it can hold various baby accessories: diapers, wipes, creams, bibs, toys, etc. There are 8 separations inside and 3 pockets outside. All of them are detachable so the user can change the inside space for the different shape of stuff. There are a lot of reasons that could be keeping baby awake. And it is the responsibility for parents to organize kid’s schedule and provide good sleep. But getting a little one to bed can be a real challenge. In this case, the gadgets that produce nightlight and calm melodies are good choices. The Skip Hop Lamb Moonlight is a winner on many levels. Due to the design with soft fabric, this nightlight looks like a cute toy. Thanks to the starry nightscape projection it makes an environment which calms the baby. This gift idea for new parents is supporting the audio feature. The nightlight plays 4 gentle melodies. Also, it has an auto-off function after 20-minute work. If your friend’s baby is entering the teething era, the food processor or blender is able to be a useful gift for them. Solid foods might be a little hard for the gums, but with the right kitchen equipment, it can be turned to paste. 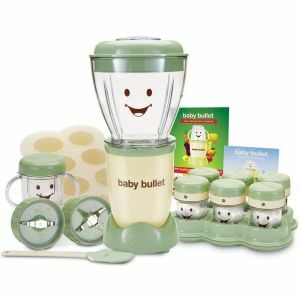 The Magic Bullet Baby Bullet is a great decision to start getting the kid off the bottle. It is produced for busy parents who want to prepare the health and nutritious baby’s food by themselves. This friendly-faced blender is incredibly easy to use. All that needs is to pre-cook some food (bake, boil or steam some vegetables, fruits or meet). Then just put them inside the blender bowl, attach to the power base, and press down the button. The Magic Bullet Magic Bullet is delivered with 6 storage cups lids. So, young parents can store baby’s food in the refrigerator for up to 3 days. This blender also comes with the trays for freezing. When the time to solid food is becoming, it might be both fanny and messy period. Especially messy, if new parents do not have a special baby’s utensils. So, in that case, Boon Dispensing Spoon can be a useful gift for new mom and dad. Be sure, it makes the feeding time more pleasant for parents and more interesting for the baby. The Boon Dispensing Spoon is an excellent gift for parents on the go. It can be an essential part of baby’s tools during the walk or on a long ride. The design of this spoon by Boon includes a bulb for food and a deep spoon. The bulb is easy-to-feel and holds up to 3 ounces. 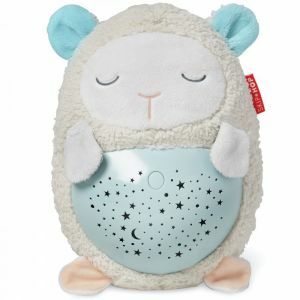 A white noise machine such as Lectrofan White Noise Machine is a perfect tech gift for first-time parents. This device creates the special sounds in little one’s ears which helps to sleep better. If the baby awakes during every night, the generator of white noise might be a solution. 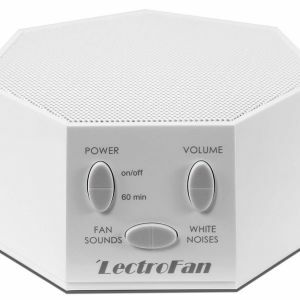 The White Noise Machine by LectroFan is suitable both for kids and adults. 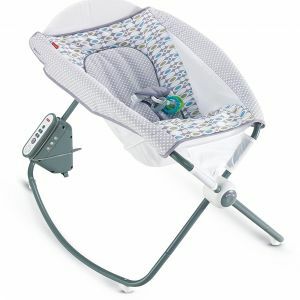 It offers twenty gently sounds to mask extraneous noises and supports deep baby’s sleeping. All of the sound options can be personalized with pin-point volume control. As you can see, new parents face different challenges in caring for their little ones. But the right gift can make their and baby’s life much easier and pleasant. And only you, as a close friend or family member, are able to give relief to them. Hope, our top gifts idea for new mom and dad helps you to make a good choice, even just a little bit.